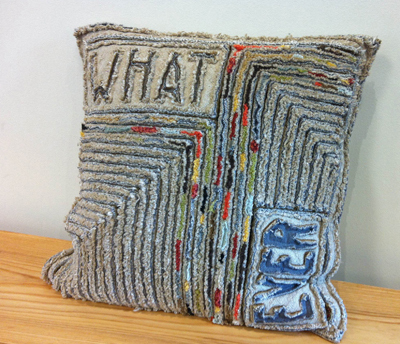 More of Tom's work, specifically his sculptural pieces, can be found in either the Sculpture or Textile Sculpture sections. 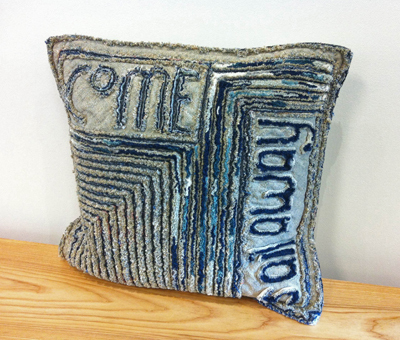 Made of handcrafted multi-layered textiles, in a process he calls Ridge and Furrows. 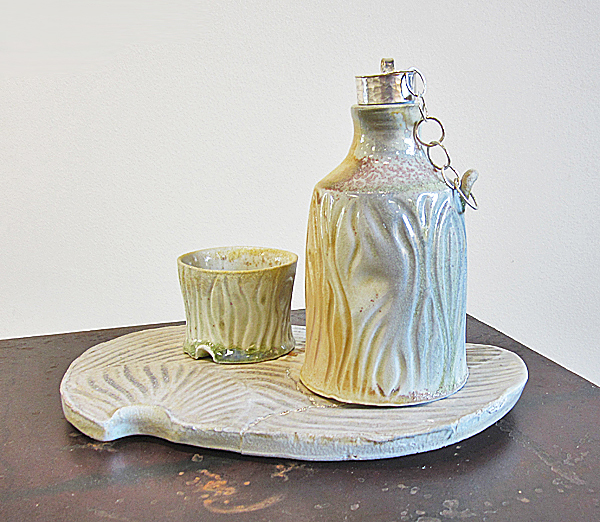 Dimensions: 18" x 18". 'Tis the season! 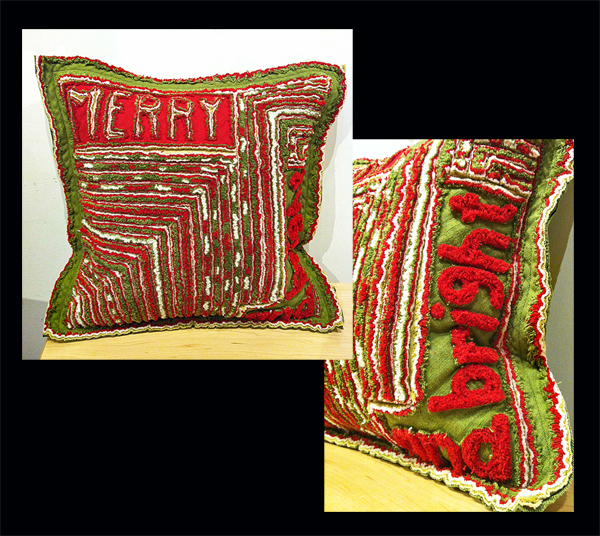 Snuggle up with this wonderful pillow for a festive Merry and Bright look anywhere in the house. Crafted in Tom's signature Ridge-and-Furrow technique and ready to dress up your couch for the holidays. 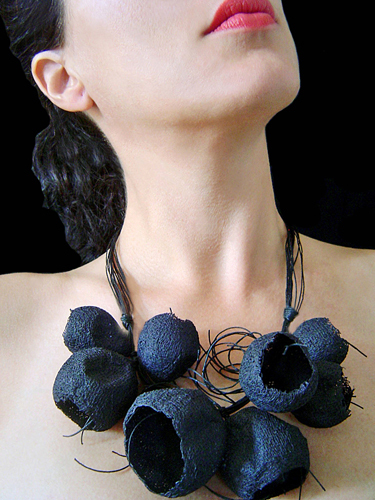 Dimensions: 18" x 18". 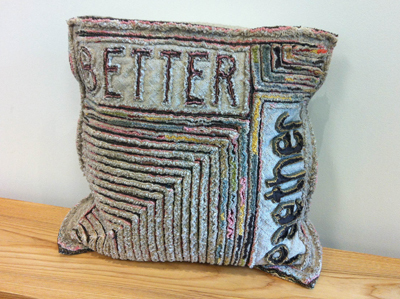 "Better Together" Pillow made of handcrafted multi-layered textile - Ridge & Furrows - Dimensions: 18" x 18" CONTACT us to ORDER your CUSTOM pillow in this style! 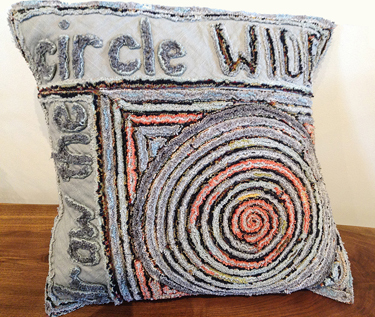 Come Sail Away Pillow is made of handcrafted multi-layered textiles - Ridge & Furrows - Dimensions: 18" x 18"
This beauty wandered in just in time for Christmas gift-giving! 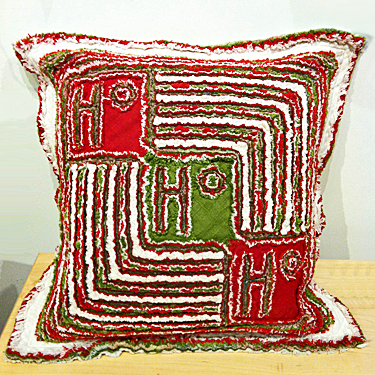 Created in Tom's trademark multi-layered Ridge-and-Furrows fabric, this is lovely and snuggly, all dressed up in colors of the season to add holiday spice to your couch! Dimensions: 18" x 18". 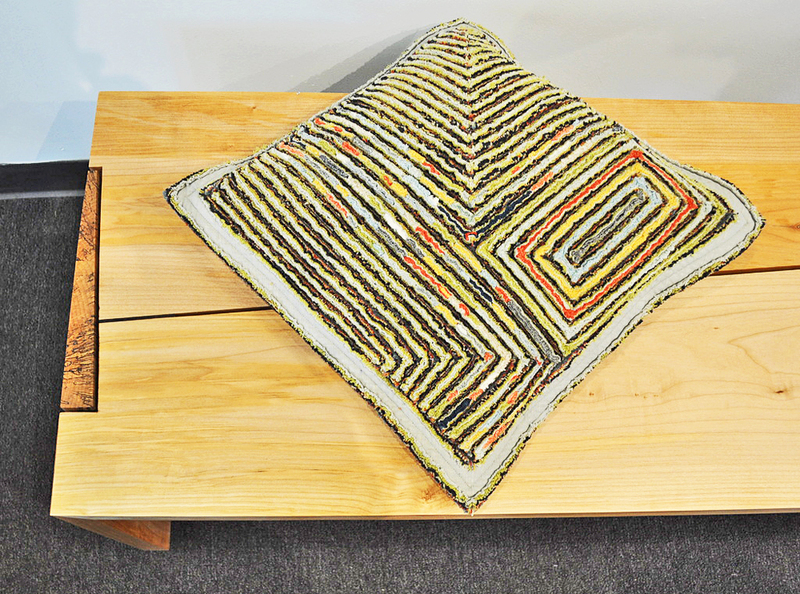 Made of handcrafted multi-layered textiles in the artist's signature Ridge & Furrows style. Dimensions: 18" x 18". 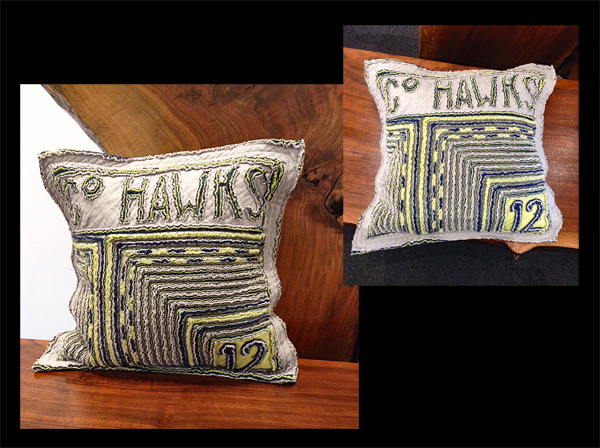 To order your own custom pillow, please contact the Gallery. 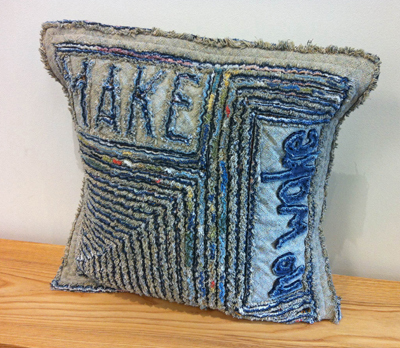 Make No Wake Pillow is made of handcrafted multi-layered textiles - Ridge & Furrows - Dimensions: 18" x 18"
No Name Pillow is made of handcrafted multi-layered textiles - Ridge & Furrows - Dimensions: 18" x 18" CONTACT us to your order your CUSTOM pillow in this style! 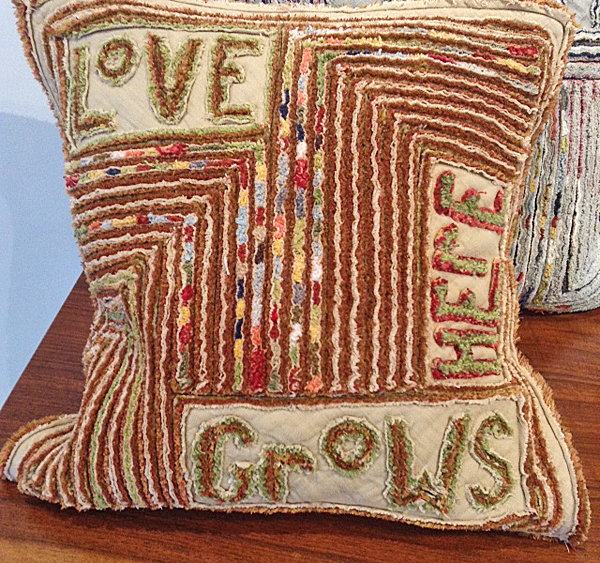 What Ever Pillow is made of handcrafted multi-layered textiles - Ridge & Furrows - Dimensions: 18" x 18" CONTACT us to order your CUSTOM pillow in this style!